Technology can be a very intimidating topic, whether in film or print. Try to explain an underground technology group to your average person and they’ll tend to run screaming from you. Director Brian Knappenberger found the best way to tell the story of Anonymous: start at the beginning. Portraying the group’s inception at notorious site 4chan, the group begins as a bunch of merry pranksters who thrive on posting content that no amount of mind bleach can ever wipe from your memory. By establishing this group as mostly normal people, you get a sense of belonging and are ready to take the ride to the darker side of Anonymous. To go any further would be just to describe the film, which would be a huge disservice to the story told. Suffice it to say that the group gained a self-awareness that they can use their numbers for what they considered social good. By bluntly describing the pros and cons to having a collective without a single head leading the group, it’s easy for members to be sucked into jobs that are questionable ethically. What I found fascinating is the variety of operations the group embarked on, some you may have heard of, and some that were widely ignored in American media. The result of them changed political landscapes and corporate and religious policies. The film is given an oddly personal feel by not only featuring technology journalists who have covered Anonymous over the years, but also current and former members of the group. Current members generally conceal their identities behind Guy Fawkes masks and former members are either known as the result of lawsuits or came out in public of their own volition. What is probably the most important part of this film is the fact that this group is motivated by a sense of social justice and freedom of speech. Whether it’s helping people in Tunisia and Iran circumvent their country’s internet restrictions or bombarding domestic websites with DDoS attacks, it’s all in the name of free speech. It’s in looking at this side of the group that a concept that needs to be more widespread comes to light. Whereas DDoS attacks are seen just as hacker attacks, the argument is made that they are actually a digital version of a sit-in like the civil rights movement had. Essentially, denying access to a website who you disagree with vehemently is akin to taking up all the seats in a restaraunt so nobody can come in and eat. Even if in the end you disagree with this definition, it gives the vague and menacing term DDoS a crystal clear analogy. Everything isn’t rainbows and puppy dogs with Anonymous, though. 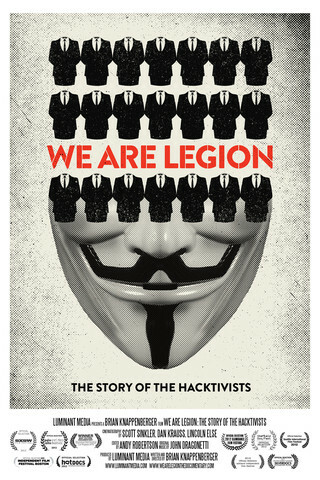 The film is thorough and honest about the group and people who splintered off into the Lulzsec branch. Some people agree with what they did and others think they gave hackers a bad name. By presenting the entire story, it is left to the viewer to make their own mind up about the entity of Anonymous. As a whole, We Are Legion is an incredibly entertaining film that is immensely informative and will open your eyes to the newest frontier of free speech. Whether you agree with what Anonymous does or not, the reality is that the internet is truly a frontier like the wild west where people are grabbing power wherever they can. The fact that it is a worldwide asset means it isn’t something that America or any other country can realistically regulate or control. For now, we have to rely on groups who do what is necessary to make sure it stays open. Tickets are currently available for the screening at The Starz Denver Film Festival. It is also available for download from iTunes and the film’s official website.